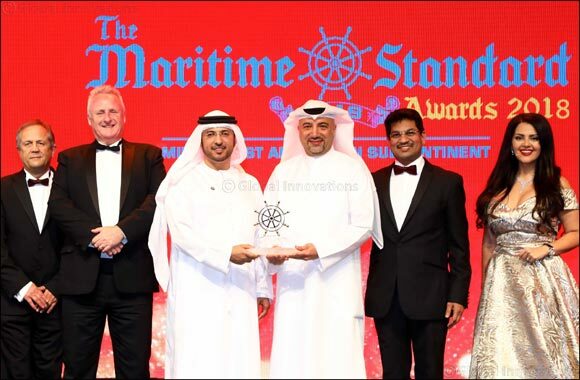 Dubai, United Arab Emirates, 20 October, 2018: Regional trade enabler DP World, UAE Region has been recognised for its industry leading services and practices at this year's Maritime Standard Awards, winning the Terminal Operator of the Year category. The award was received by Joost Kruijning, SVP & COO, Ports and Terminals Division, DP World, UAE Region on behalf of the company during a gala ceremony attended by industry leaders from shipping companies, ports, terminal operators and others in the sector. Abdulla Bin Damithan, Chief Commercial Officer, DP World, UAE Region presented The Maritime Standard Personality of the Year Award to Ali Shehab, Deputy CEO, the Kuwait Oil Tanker Company. DP World's flagship Jebel Ali Port is one of the most technologically advanced ports in the world and has been rated as the most productive globally. It has a handling capacity of 19.3 million twenty-equivalent units (TEU) a year and has become the preferred destination for cargo entering the MENA region, serving as a major transshipment hub for cargo on one of the busiest trade lanes in the world. Mohammed Al Muallem, CEO and Managing Director, DP World, UAE Region, said: “This award recognises our approach of adding value to our customers, making the transport of cargo faster and better for the communities we serve. That value springs from making life easier for our clients so they can focus on growth, innovation and raising operational standards. “Our ability to offer a range of inter-connected services such as Jebel Ali Free Zone, National Industries Park, and Dubai Auto Zone alongside the Port has created one of the most efficient and robust supply chains in the region, with unmatched connectivity by land, air, and sea. The Maritime Standards Awards are one of the most prestigious events in the Middle East and Indian Subcontinent regions, recognising the most innovative and successful players in the industry. The award highlights Jebel Ali's role as a premier trade hub for goods moving through the region and its position as a preferred destination for businesses looking to tap into DP World's extensive global network that reaches out to over 2.5 billion people in North and East Africa, the Indian subcontinent, and the GCC. In 2017, Mohammed Al Muallem, CEO and Managing Director, DP World UAE Region, was named the TMS Personality of the Year.